She said Kardashian is stuck in a "prison of self critique." Just a few months ago, Jameela Jamil made headlines by shaming detox teas and the celebs who promote them (a.k.a. Khloé Kardashian). Now The Good Place actress is at it again, but this time she's after a weight-related quote Kardashian posted on her Instagram story. 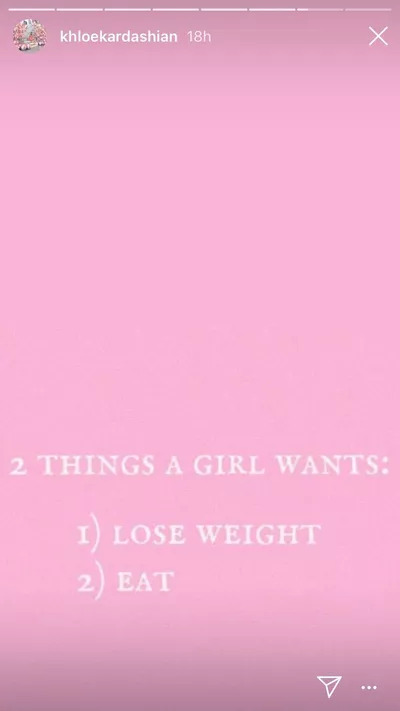 The story reads: "2 Things a Girl Wants: 1) Lose Weight. 2) Eat." Jamil wasted no time sharing her thoughts on Twitter. "This makes me sad," she wrote. "I hope my daughter grows up wanting more than this. I want more than this. Sending love to this poor woman. This industry did this to her. The media did it to her. They fat shamed her into a prison of self critique. Dear girls, WANT MORE THAN THIS." Both ladies are part of the body-positivity movement—Jamil with @i_weigh, an Instagram page promoting self-love, and Kardashian with Good American, a size-inclusive clothing line. Kardashian hasn't responded to Jamil's comment as of now, but she has been known to stand up for herself on social media, so we'll be keeping our eyes peeled.